Parsons Green was a hamlet in the manor of Fulham, and according to Bowack, writing in 1705, it was inhabited "mostly by Gentry and Persons of Quality". It was noted for its clean, fresh air and consequently many aristocratic families built their homes here. 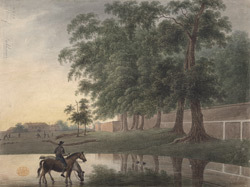 As seen in the watercolour, there was a pond in the south east corner of Parsons Green.